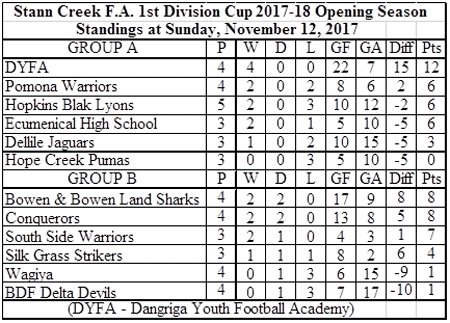 DANGRIGA, Tues. Nov. 14, 2017–The Stann Creek Football Association (SCFA) continued over the weekend with its 1st Division 2017 Cup Tournament Week 7 games at the Carl Ramos Stadium. The top four teams from each group will qualify for the playoff round, and we are winding down. In game 1 on Friday, November 10, Bowen & Bowen Landsharks bombed BDF Delta Devils, 8-2, with goals from Alexander Peters (30’ & 70’), Carlos Lino (67’ & 88’), Darnel Swazo (30’), Kevin Moralez (65’), Carl Saravia (89’) and Dinsdale Rogers, Jr. (41’); while the Delta Devils got a goal each from Quesneay Williams (79’) and Robert Hernandez (85’). And in game 2, it was Hopkins Blak Lyons, 6-2, over Dellile Jaguars. Hopkins got a goal each from Sedrick Zuniga (31’), Devaney Tillett (49’), Norman Nunez (53’), Franz Nunez (62’), Anthony Penate (67’) and Mark Petillo, Jr. (80’); while Dellile goals were by Tylor Peters (24’) and Timothy Estero (58’). 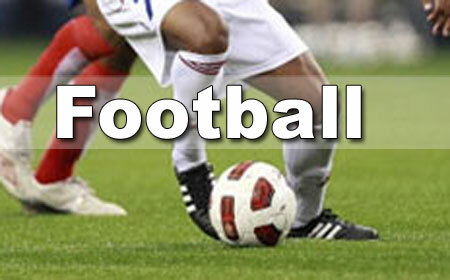 The games scheduled for Sunday, November 12, were not played due to the bad weather conditions. These games will be played as back matches.